A successful weight loss plan should include a low carb diet to achieve a calorie deficit, cardiovascular exercises to improve heart and fat burning, and lightweight strength exercises to tone your muscles. Running, cycling, jumping rope and swimming are all perfect options to improve your fitness and increase your metabolic rate as well as burning more calories. Lightweight strength workout could help you to tone muscles, increase metabolism, burn more fat. Feeling hungry is the main reason that could make you give up on your diet. 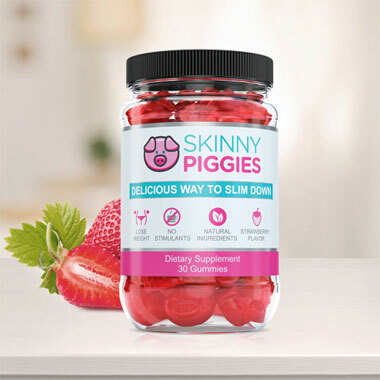 Skinny Piggies are appetite suppressing gummy supplements that will help you fighting hunger feeling. Take one gummy with a full glass of water half hour before each meal. It will make you feel satisfied and reduce sugar cravings. Which OTC Appetite Suppressants Work? Which Fiber Supplement Should I Take? Do you like eating great tasting dishes but also really want to burn fat? Losing body fat is all about creating a negative caloric balance which means almost certainly you'll be hungry all the time. Fortunately, there is an ingenious product that can help you: Skinny Piggies. What is that and how will it help? Let's talk about the details you should know first. To burn off more calories than you take in, you either need to increase the amount of exercise or reduce how much you eat. To get best results, you may want to do both. Skinny Piggies help you eat less and cut your caloric intake which makes achieving weight reduction easier. Add in an additional regular workout in order to help speed up the weight loss process. If only weight loss was that easy... Although cutting back on your daily calories seems easy enough, in real life your sugar cravings are likely to make you pining after sugar snack all day. And that's where Skinny Piggies gummies can help. Skinny Piggies are fun, sweet healthy treats you won't need to feel guilty about! Enjoy the succulent flavor of these slimming gummies and let them do the rest of the work. Ok. So, what exactly are these gummies good for? The idea behind Skinny Piggies gummies is surprisingly simple. Your appetite is caused by 2 key ways: the number of calories you eat and the feeling of food in your stomach. After a big meal, your stomach stretches in size by the food pressed up against the sides, which results in you feeling full and you stop eating. When you ingest a Skinny Piggy just twenty minutes before your meal with an 8oz cup of water, it will gently expand into a soft gel, activating stretch sensors in the stomach, notifying the brain you just ate plenty of food. That way, when you do eat, you are already partly full and consume a smaller amount of calories as a result of it. This way you can reduce the urge for food and eat less, without seeming like you're on diet. When you use the Skinny Piggies slimming gummies right before meals, they coat the food in a gel. This slows down the movement of the sugar and carbohydrates you consume into the blood. This manages to keep your blood sugar more stable and makes sure that you stay in fat-burning mode whole day. It may even help make your workouts feel much easier. Thereis no limit to the types of diet products being sold on the internet. From weight-loss dietary supplements to appetite suppressants, it's hard to know what diet supplement will work for you. 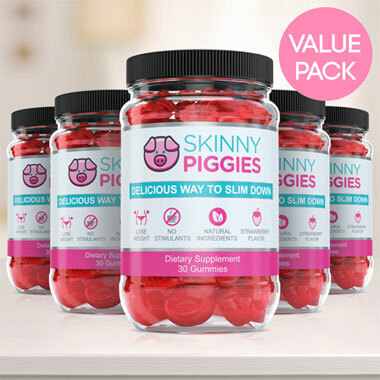 Going through the online research on each product is a fruitless task, but Skinny Piggies stand out among the rest for the following reasons. Well-balanced Ingredients: In addition to helping you suppress appetite, they also support the growth of stronger hair and help your skin look younger. Genuine Ingredients: Unlike other diet supplements, it's easy to pronounce every ingredient in Skinny Piggy diet supplements, knowing that you're filling your body with only the best nutrition. Delicious Taste: Very few gummy supplements actually taste good, and almost none have the delightful taste of strawberry gummies, meaning that Skinny Piggies are a snack you will want to use before your meals. No Harsh Stimulants: Taking a dietary supplement without harsh stimulants and that's why you may take them even in the evening. Losing body fat is not easy, but delicious Skinny Piggies are here to make the process more easy. You will love the refreshing taste of these gummies so much, forgetting to eat your supplements daily will be a breeze. 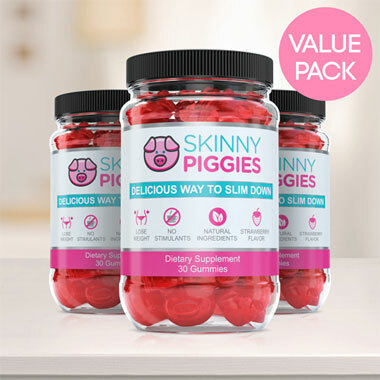 Simple to use and fulfilling, Skinny Piggies are dietary supplements that is delicious and fun to eat.